(10:15 a.m. EDT ) -- Norwegian Cruise Line Holdings Ltd. has confirmed an order for two new ships that will be smaller than its most recent new builds, giving it more options in terms of destinations. The 3,300-passenger ships will be the fifth and sixth in Norwegian's new Leonardo Class, and are slated to launch in 2026 and 2027. The first Leonardo-class ship is set to debut in 2022. "These orders extend our disciplined and measured newbuild program and strong growth trajectory well into the future… " said Frank Del Rio, president and CEO of NCLH. "Our six-ship Leonardo Class fleet will allow us to broaden our deployment into strong performing and mature unserved and underserved markets and offer new experiences to our guests." 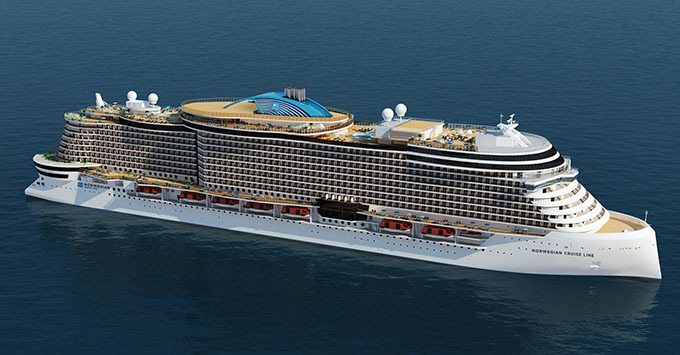 Leonardo-class ships will be larger than the line's 2,500-passengger Jewel-class ships but smaller than the 4,000-plus-passenger Breakaway- and Breakaway Plus-class ships (including Norwegian Breakaway and Norwegian Bliss). Previously released renderings show a wider Boardwalk area at the aft of the ship and a section of aft cabins that resemble Miami condos. Energy efficiency will also be a key component of the ships, with a design emphasis on optimizing fuel consumption. Norwegian also has another new Breakaway Plus-class ship, Norwegian Encore, due to launch in 2019.